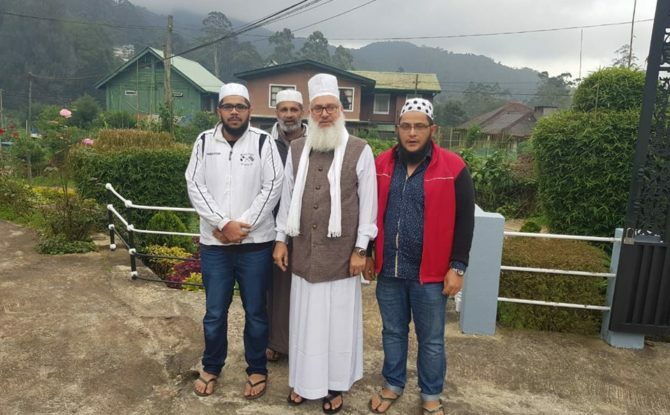 The AIUMB President has gone on a visit to his spiritual followers in Sri Lanka to work on spirituality, humanity and morality that can be carried out through Sufism. He founded the World Sufi Forum in 2016 which has grown vastly all over the globe including Sri Lanka. He has also granted permission for Baiat-o-Iradat (administering oath of spiritual allegiance), as an heir to the Chishtia, Nizamia and Ashrafia lines of mysticism. He has a vast number of disciples in different parts of the world including Sri Lanka. New disciples are introduced in accordance to the aforementioned mystical paths (silsila). The World Sufi Forum that Hazrat has initiated is growing globally as each day passes. Through firm determination and constant struggle, Hazrat is engulfing the world with his key messages: Tolerance, Acceptance and Unconditional Love. It is noteworthy that Hazrat Maulana Syed Mohammad Ashraf Kichhauchwi son of Sayyad Izhar Ashraf Miyan—popularly known as “Shaykh al-A’zam”—the eldest son of Hazrat Sarkar-e-Kalan Sayyad Mukhtar Ashraf (Rahmatullahi alayhi). This clearly shows that he falls in line with the many esteemed and pious Sufi saints that have come through the Chishti-Nizami-Ashrafi Silsila in Kichchawcha Shareef. It has been the salient characteristic of the Ashrafi Sufi hospice (Khanquah) that in every period, there has been an eminent personality accomplished with both spiritual and modern education, mystical inclination, intellectual grandeur, inherited zeal and determination showing path of Shariat (Revealed Law) and Tariquat (way to Allah). Alahazrat Ashrafi Mian (R.A.) adorned it up to 1355 AH devoting his whole life in making the world familiar with name and mission of Hazrat Makhdoom Simnani (R.A.) followed by Mufti Syed Shah Mokhtar Ashraf (R.A.) who decorated this dignified office with his sublime spirituality for 62 years. Now Hazrat Maulana Syed Ashraf is inheriting virtues of his righteous predecessors and spiritual ancestors, possessing extraordinary merits whose religious, spiritual and reformatory activities and works have been, internationally recognised and admired. Hazrat Syed Ashraf Kichchauchwi has been instrumental in promotion of Sufism in the modern India as well as aboard. With his progressive views on religion, nation and society, he has the future needs of the new generation of Muslims at heart.